Top winners of the Drop Savers Water Conservation Poster Contest show off their artwork at the Tallahassee City Commission meeting. Pictured: First Place Winner Kendall Reed of Desoto Trail Elementary School, Second Place Winner Jason Wheeler of Desoto Trail Elementary School, Third Place Winner Hanna Knight of Roberts Elementary School, City employee Dave Roberts, Tallahassee Mayor Andrew Gillum, Bharat Talasu and his daughter showcasing Ruchir Talasu’s Third Place poster, City employee Jennifer Porter, Dr. Cassandra Poole, Assistant Principal of Desoto Elementary School, showcasing of the Honorable Mention poster of Branson Hurst, Honorable Mention winner Brianna Barfield and City Commissioner Nancy Miller. “Life without water is no life at all.” That piece of wisdom, complemented by colorful, inspiring artwork, helped Kendall Reed take first place in the City of Tallahassee’s Drop Savers Water Conservation Poster Contest this month. Reed, a student in Kim Morris’ class at DeSoto Trail Elementary School, was one of 800 local fourth graders who let their creativity flow for the fun and educational competition. Each year, the City and the Florida Section of the American Water Works Association (FSAWWA) hold the popular contest to encourage water conservation and natural resource protection. First, second and third place winners (and in many cases honorable mention designees) were chosen from each participating class. 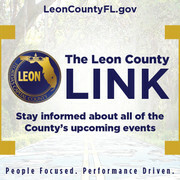 More than 100 winners, representing schools throughout Leon County, received prizes at an award ceremony on May 9 at Lincoln High School. 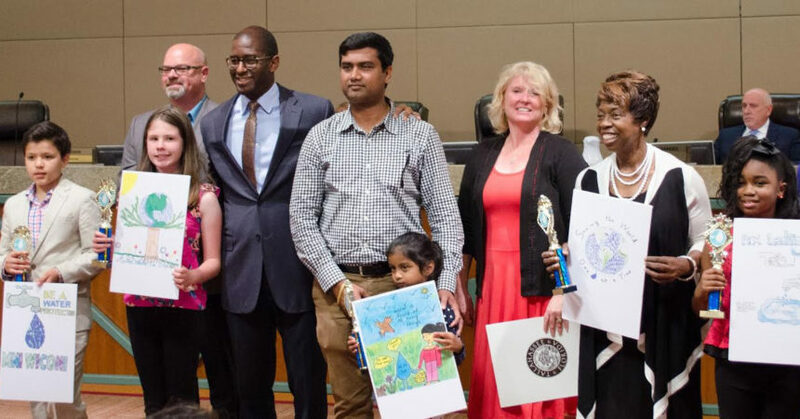 In addition, the six overall, countywide winners received recognition at a special ceremony at the May 10 Tallahassee City Commission meeting. Their artwork is on display now and will be up through December 2017 in the City Hall Art Gallery, located in the second floor mezzanine, 300 S. Adams Street. In addition to spreading the word about water conservation, the poster contest helps draw attention to the City’s great tasting and top-rated drinking water. The City has provided high quality drinking water to area citizens for more than 100 years and won the 2016 title of Best Tasting Drinking Water in a rigorous statewide competition sponsored by the FSAWWA. Tallahassee is the first municipality to win this honor three times (2008, 2015 and 2016) since the inception of the FSAWWA in 2003. Access to the Floridan Aquifer, one of the largest and most pristine sources of water in the world, combined with vigilance by the City’s award-winning water utility, helps ensure that Tallahassee will continue to enjoy high quality drinking water for many years to come.